Sunday January 20th 1895 It was not fit for us to go to church. Will went over to Woolfs to get our sausage grinder and when he came back put it through the mill and I seasoned it as the weather is too warm for it to keep without. After I got the dinner over I read and wrote what time I had the rest of the day. Monday January 21st 1895 There was a pefect blizzard of frost today. I was busy the greater part of the day as I had bread baking and churning to do. I read what spare time I had in the afternoon and evening. Will walked to town after dinner. Tuesday January 22nd 1895 It was more pleasant today. Will went to the timber for wood. David helped me wash. I got dinner early and David took the wood on to town and Will and I went in. I stopped at Fannys found her busy with the work as her girl was sick. I was only up home a little while. We came home in good time. Did the evening work and read till bed-time. 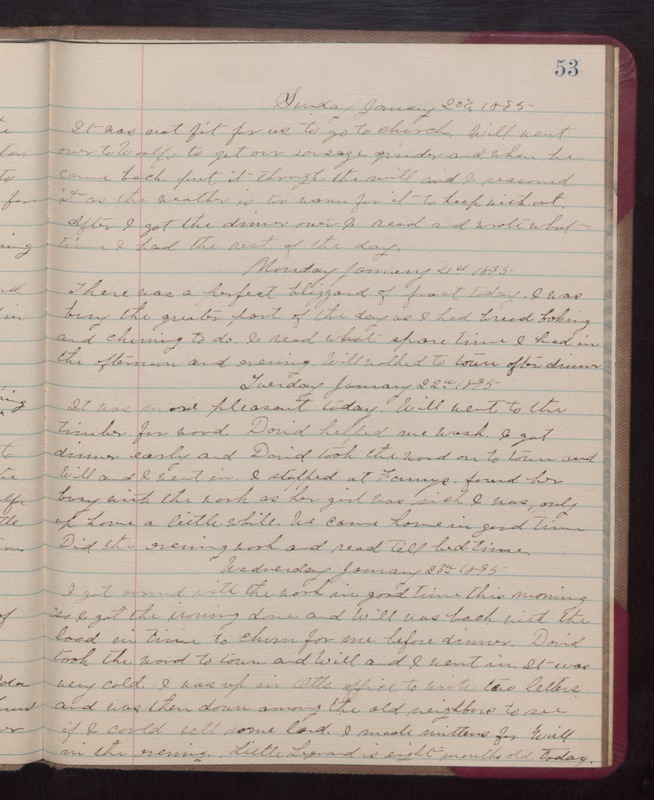 Wednesday January 23th 1895 I got around with the work in good time this morning so I got the ironing done and Will was back with the load in time to churn for me before dinner. David took the wood to town and Will and I went in. It was very cold. I was up in Otts office to write two letters and was then down among the old neighbors to see if I could sell some lard. I made mittens for Will in the evening. Little Legrand is eight months old today.